Gaian Economics: Quantitative Easing for the Poor? Creating money was once looked on as a dangerous game, destabilising the economy and potentially leading to rampant inflation. But this traditional wisdom was swept aside and now the financial junkies are protesting the advertised end of the policy in the US and creating market falls on the basis of those expectations. In the UK context, researchers at the Bank of England investigated the distributional effect of their QE policy, i.e. who were the winners and who were the losers. Their conclusion was that most of the benefits accursed to the wealthiest 5% while some of this living on pensions were losing out quite substantially. On the radical side of economics we have been trying to argue for direct credit creation for social benefit. At the beginning of this month the New Economics Foundation issued a report formalising this demand. Strategic quantitative easing makes the case that new money should be directly created by government to fund the transition towards a sustainable economy, particularly paying for green infrastructure and the rapid policy of home insulation that will reduce carbon emissions and prevent deaths through cold this coming winter. Now it seems that the US government has found a way of making credit creation work for the poor. I had not realised until I watched Faisal Islam's extraordinary report on the Rhode Island gold card the sheer extent of the federal food stamps programme. 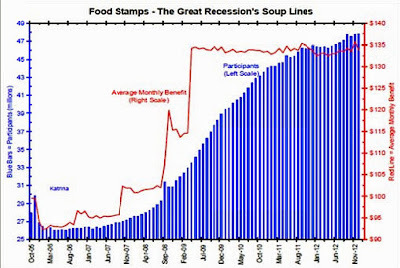 US commentators have noted that the food stamps programme is the modern equivalent of the Depression era soup kitchens. It seems sadly symbolic of our individualist and technocratic age that rather than sharing a bowl of soup, in no matter what dreary conditions, today's dispossessed are issued with a deceitful imitation of the gold credit card of the wealthy. Nationally, the number is approach 50 million and as Islam's report showed, it is now remarkably easy to use your preloaded card to do your shopping. Now I know that the money to pay for this programme, a huge $75bn., is not directly created, but since the quantitative easing programme buys back treasury bonds, thereby reducing the debt, it effectively creates the scope for this massive federal programme for the poor. It also makes clear that questions about how money is made and who has the right to decide how it is spent has been removed from democratic control through the increasing use of technical language for what is really simple. Governments can make money directly and it is a political choice that in the UK that money is sent to financial institutions rather than to help the poor.